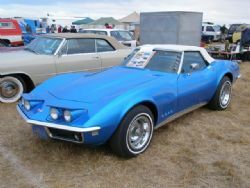 I was down in Victoria for a week and decided to check out the 20th Annual Super Southern Swap Meet at Ballarat airport. 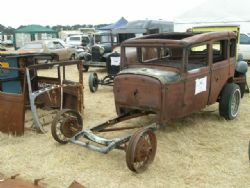 This event is touted as the largest swap meet in Australia and has a reputation for hammering the attendees with stinking heat, northerly winds, rain and dust. 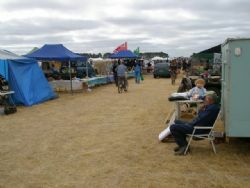 The swap meet used to run for three days, now it has been cut down to two. I figured there were still a few out there like me that enjoy the touchy feely aspect and the ability to haggle without having someone swan in one minute before the close of the auction and pinch what you wanted from under your nose. If you want the good stuff, you have to get there early. It kicked off at 7 am and by the time I arrived at 7.20 the car park was filling and a lot of the guys selling stuff were having a good sniff around. Initial impressions were it is big and if you walk the entire length you would easily clock up more than 25 kays. There were quite a few gaps in the field but there was still plenty on offer. A number of businesses had spaces but most of it was guys dragging the junk out of the shed to see if they could make an earn. Most of it was car related but there was the odd brick a brack and occasional stand where I thought the guy should have just kept going to the tip. If you were looking for something in particular there would be a fair chance you would find it. 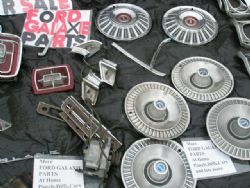 I saw everything for most makes and models, complete cars for restoration, restored cars, rusty shells, a gazillion parts and even the proverbial kitchen sink was for sale. As the day wore on the crowd grew bigger although I heard a number of vendors muttering there were plenty of lookers but not many buyers. The old hands who had done it all before knew the score. They bought their pushies with them and were pedalling around the grounds which was a smart way to get around and see what was there before it got picked over. Plenty of guys were pulling trolleys so there seemed to be interest in buying stuff. I only stayed for the Friday and was blessed with a cool grey day that was perfect for stretching the legs, checking out the stuff and having a chat with a few people. It will be interesting to see how these events go in the future and although shopping online has its advantages it is still a lot of fun to get out and see so much different stuff all in one place, check out the characters and enjoy the atmosphere.